NOBODY lives there yet, but when they do residents at the new Madox estate in Piara Waters won’t have to go far for their hit of steaming coffee or fresh produce. 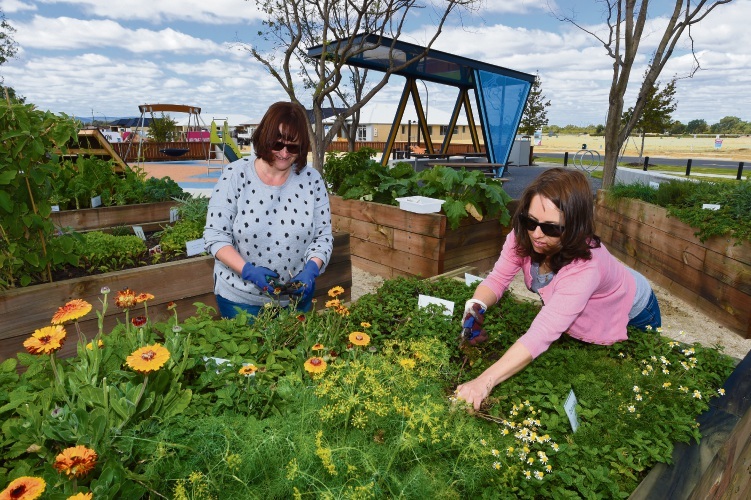 With the estate’s first new residents preparing to move in, Madox developer Mirvac is ready to welcome them with the recent opening of a new cafe, Running Latte, as well as a community garden filled with more than 30 kinds of herbs, fruit and vegetables. Local Sharon Barnett, who helps care for the community garden with the help of other volunteers, said it gave the community access to fresh produce throughout the year. “None of us have extensive backgrounds in horticulture, we just come together as a community and we make it work,” she said. “I have grown a lot of my own vegetables at home in the past and thought it would be great to have something like this in the Piara Waters community. Madox’s multi-use Explorer Park will soon add to the facilities on offer, with work scheduled to finish next month.